Performers include: Nate Berkus, host. This daytime talk show is hosted Nate Berkus, a former regular contributor to The Oprah Winfrey Show, a design expert, and a New York Times best-selling author. The weekday series provides information and inspiration that helps viewers transform their living spaces and lives in a variety of ways. In addition to utilizing a “dream team” of lifestyle experts, Berkus gives practical and accessible information about design, decorating, fashion, cooking, gardening, beauty, health, relationships, family, career, personal finance, entertaining, and party-planning. Episodes also offer regular segments. “House Proud” allows fans to take Berkus and viewers on a tour of their beautifully designed homes and explain how they can get the same look in their own homes. On “Nate’s Crate,” lucky fans receive a special delivery on their front doorstep and are challenged to transform a living space — using only the items in the box. As part of “Nate’s Finds,” Berkus shares his favorite finds and affordable design trends. “Audience Design Dilemmas” gives Berkus an opportunity to answer design questions from his audience and share quick tips and solutions. On “Money Matters,” Berkus and his financial experts work with real people to explore ways to save money via creative ways. Nate shows video of “House Proud” viewers in Dallas and Raleigh, North Carolina, as well as the kitchen of celebrity chef Guy Fieri. First aired: May 24, 2012. WHAT!!!! You have got to be kidding me, I really hope this is just a joke!! I watch the Nate Berkus Show every single time it’s on, I don’t miss an episode, so what’s up!! 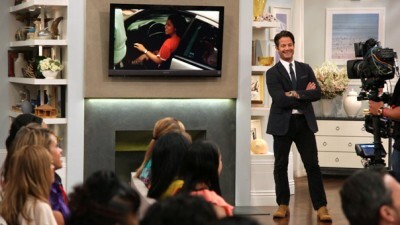 PLEASE, PLEASE BRING BACK THE NATE BERKUS SHOW!!! My Heart <3 is BROKEN, come on!! Thanks and I'll be waiting for THE NATE BERKUS SHOW to be back on soon!!! I am so sad to learn that the Nate show has been cancelled. I have waited all summer for this show to come back. I really hope that the Oprah network will pick up new seasons. I have already seen all the other shows and done all the cool stuff he brought to his viewers!